Our Solar Window Screens Will Stop the Sun's Heat! Are you looking for relief from the summer heat in Round Rock? Our Texas summers can be brutal, and the cost of running an air conditioning unit can be astronomical around this time of year. Luckily, there is relief in sight. The Austin Shade Team is proud to service the Round Rock area with our exceptional products, including our solar window screens and roller shade screens. If you’re looking to escape the intense Super Hot Round Rock sun while making your home more energy efficient, call the Austin Shade Team today. We are dedicated to providing exceptional customer service and products that are unmatched in the area. For more about our service area, click here or view our helpful map. How can we help? The Austin Shade Team is prepared to deliver unmatched service when it comes to the following. Solar window screens are the ideal option for shading your windows and eliminating the heat transfer caused by the sun’s penetration, as well as aiding in protection from the sun’s harmful UV rays that may enter your home. The Austin Shade Team specializes in the measuring and installation of custom solar window screens on each and every window of your home. What’s more, we have a variety of density and color options so that you never have to compromise your home’s look. Here’s what a solar window screens looks like. This is a solar window screen that we are about to install on top of a horizontal sliding window, I mean by a horizontal sliding window is a window that slides to the left and right. For most horizontal sliding windows we will have to direct screw the screen to the outer edges of the window framing. Direct screwing the solar window screens is minimally invasive to the window, and is always applied, attached, to the outer framing of your window. Never will our direct screwing method impede, or get into the glass of the window. We are students of these windows, we know where the glass ends within the window frame, so we will never get into the glass. Here’s a triple set of windows, three windows mounted next to each other, that accepted three solar window screens. This picture shows three separate Windows mounted next to each other. In this case that’s three 35 inch wide windows by 96 in tall. These 35 by 96 inch tall windows are mounted next to each other to give the impression that it’s one large window. This is not one large window, it is three separate windows, resulting in a need for three separate solar window screens. Because the solar window screens are so large, you want to use a clip in the middle of the solar screens to hold the solar screen up against the window. The solar screen will remain held up against the window from once we install it just fine, but that clip is there to make sure that whenever a person other than us takes the solar window screens off of the windows, they are forced to turn that clip, which in turn will ensure that the solar screens will remain seated well up against the window. What happens is when people take the solar window screens out, they have a tendency to grab the outside edging of the solar window screen frame about Midway up on either side of a solar window screen, and they pull the solar window screens out. It is this action, where they pull the solar window screens out by grabbing those left and right side frames for the solar window screen, that they slightly bend the solar window screens. They slightly bend them outward. When they go to put the solar window screens back into the windows, the solar window screens will not be pushed up against the window framing any longer, cuz they have been bent outward. Because the solar screen is not pushed up against the window framing all of the way, and has a slight bow outward, a strong wind has the possibility of getting behind that screen and pulling it out from the window. It is because of this, that we use those turn clips. As long as you continue to use these turn Clips to hold the solar screen up against the window, you will never have to worry about the solar screens coming out from a windstorm. With our transparent, efficient solar window screens, you can get a simple affordable solution that ensures your Round Rock home stays cool all summer long. 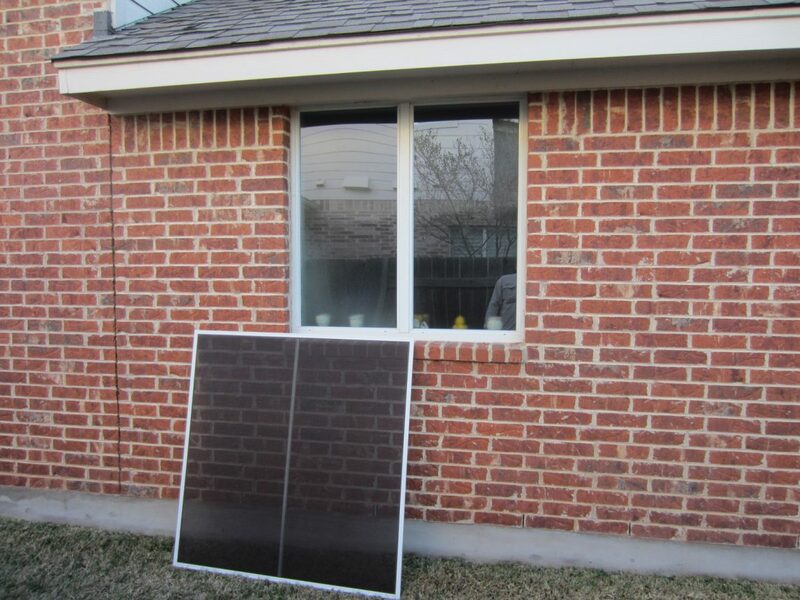 Learn more about our Austin TX solar window screens here. Perfect for installing on your Round Rock backyard patio or front porch, our roller shade screens are one of the most popular and efficient ways to protect yourself from the sun. 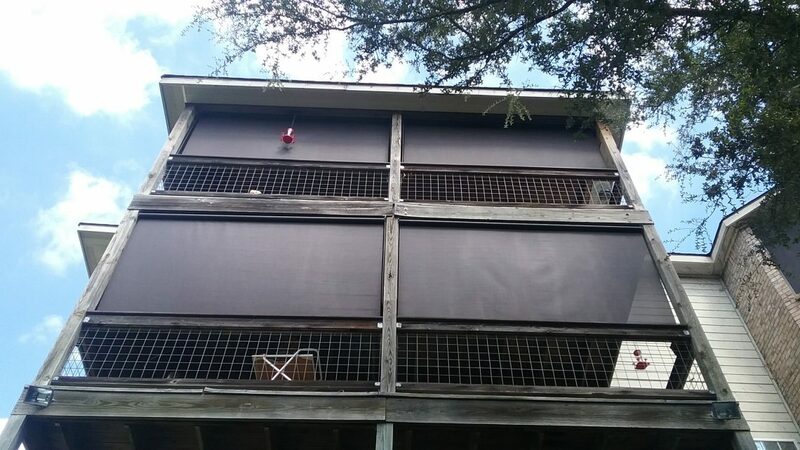 Providing a unique option and reaching lengths up to 99”, our roller shade screens can be affixed to your outdoor space to provide comfort in the mid afternoon or evening when the sun is at its peak. Here’s a picture that shows four 90% external roller shades. These roller shades are made to drop to the chair railing, for this customer’s two patios. These exterior patios face Due West, and the customer was unable to be outside in the afternoon because the sun was so intense. With these exterior roller Shades shading those exterior patios, these two patios now are getting 90% shade. These exterior roller shades are made so that you pull them up and down by way of a stainless steel chain and a heavy duty exterior grade clutch. They are really simple in Design, and are manual, not motorized, therefore the cost is a fraction of that of a motorized system. Making these exterior roller Shades a win-win for homeowners. Get colors that match your home and windows, and get the expert’s’ opinion when it comes to sizing, installation, and much more. 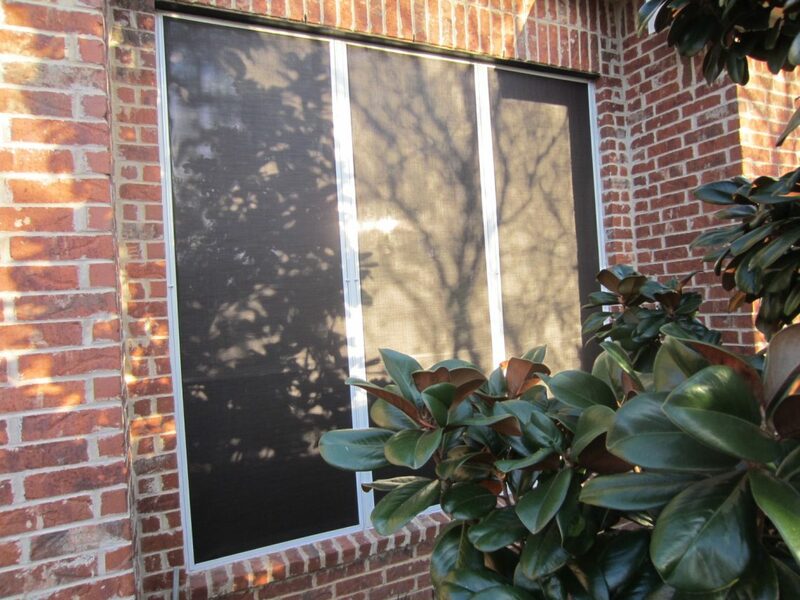 Learn more about the installation of roller shade screens.